This is our current guilty pleasure, Pancit Habhab bought from our friendly neighborhood panciteria Yuca's Pancit Habhab. Berto and I have passed this restuarant located along JP Rizal, Nangka Marikina City countless of times but never ventured in. One day though, after the Little Girl and I did some errands from the bank nearby, I decided to buy one order of pancit habhab just to satisfy my curiosity as to what it is about. I am a Pancit Bihon fan myself, but I am open to other options. Also known as Pancit Lucban, Pancit Habhab is actually a very popular street food that originated from Lucban, Quezon. 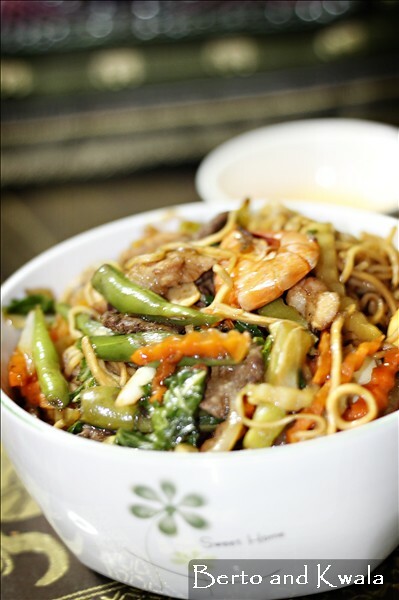 It is rice noodles made with rice flour, stir fried and mixed with vegetables, shrimp and pork. Some even add lechon to make it even more special. The term habhab actually refers to the manner this kind of pancit was intended to be eaten. The noodles is served on a small cut banana leaf which acts as a makeshift plate, then you eat it using only your mouth, without the use of any utensils. Also, instead of the usual calamansi, you sprinkle on some cane vinegar to add to the taste. The pancit habhab we bought costs P75 for a regular order and P110 for a special order, where they add some lechon liempo. Yummmy! I noted though that our take out order came in an ordinary plastic bag, no banana leaves whatsoever to remind us of how its supposed to be originally served. Other than that, the Pancit Habhab experience was heavenly. One order is good for 2-3 persons and is definitely worth a try. Berto, ever fearful to try anything new, loves it! Heat half of the oil in a wok and sauté half of the onion and garlic until it becomes translucent. Add snowpeas, carrots and chayote and stir fry fro around a minute. Pour in ½ cup of stock and simmer for another minute. Remove from wok and set aside. In the same wok, heat the rest of the oil and sauté the remaininghalf of the onion and garlic until it becomes translucent. Add pork and let fry until it browns a little.Add shrimp and stir fry until it turns orange. Pour in 6 cups of stock and soy sauce and wait for it to boil before adding pancit habhab noodles. Mix until noodles absorbs the stock and becomes soft. Add more stock until desired softness/doneness is achieved. Add the stir-fried vegetables you set aside. Season with fish sauce and pepper to taste. Serve freshly cooked with a sprinkling of cane vinegar. The Pancit HabHab by Yucatan along JP Rizal across Parco is closed! No notice where they moved! Yeah, I just recently noticed too. Too bad, I really love their food. Did you check their FB Page? Maybe they updated their address there? We Have New Babies.. 2 of Them!